Luxury Indoor Cover Tailored To Your Vehicle. 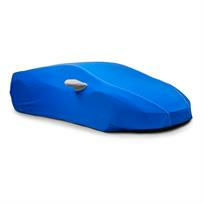 Ideal for indoor storage this bespoke, made to order cover gives your vehicle complete protection with superior fit. Manufactured from a luxurious thick cotton/mixed fibres with soft cotton fleecy inner, this breathable fabric is tightly woven to repel dust and protect against minor knocks, keeping your car in pristine condition, helping to maintain its value.